Ransacked shops. A battered monument. Four casualties. Protests have been taking place in France for the past few weeks, and the government fears that the end is not near. Every weekend since November 17, the “yellow vest” movement, aptly titled for the fluorescent safety jackets that the protesters wear, have taken to the streets and blocked roads across the country. The more violent rioters throw rocks at the police, set cars on fire, and vandalize buildings in rich areas. The protest that took place on Saturday, December 1 was the worst rioting that France has experienced in the past several decades, resulting in police responding with tear gas. 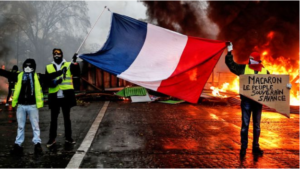 Not only have the protests caused millions of euros worth of damage, hundreds of injuries and arrests, and the vandalization of the famous Arc de Triomphe, but four people have lost their lives as a result of the unrest. However, the protests against the fuel tax soon became protests against the French government in general. Upon analyzing the initial budget plans for 2018-19, the citizens expressed outrage over their perception that the budget benefits the very wealthy while doing little for the extremely impoverished. Protesters say that they elected Macron based on his promise of economic reform, which would include improving the lives of all French citizens through lower unemployment rates and a better economy. Their discontent spurs from several specific issues, including education reforms, rising costs of living, high levels of unemployment in rural areas, and unchanging wages. The movement is bringing together people of all political ideologies, with the main common thread being that they are all barely able to afford to live. They lack formal central leadership, yet have expressed over forty demands to the government. Proposed reforms include minimum pension, several changes to the tax system, and a lower age for retirement. On Thursday, November 29, French police arrested more than 140 students as protests outside schools turned into clashes with the police. Prime Minister Edouard Philippe has expressed to the public the pressure that the government is currently feeling. Following the December 1 protests, he said that they would use “exceptional means” to counteract the protests this upcoming weekend. The government asked restaurants and shops to close temporarily and will employ more serious military measures. Specifically, close to 90,000 police officers will be on duty and Paris will utilize armored vehicles for the first time in 50 years. However, the government has also stated that the violent protests are overshadowing many peaceful protests, and that the violence is the result of extremists hijacking the protests. Regardless, the government has yielded to the protesters, with Philippe saying that the government will remove the fuel tax rises from its budget. They have also acknowledged various other concerns of the French people since the beginning of the protests. Seventy-three percent of French citizens say that they support the cause, but oftentimes disagree with the methods that the protesters chose to spread their message. Others around the country and the globe are also responding to these recent events, with a police union and two road transport unions going on strikes in France and other groups taking action based on the “yellow vest” movement’s inspiration. Sophomore Jeremy Mauser is a Staff Writer. His email is jmauser@fandm.edu.